Looking for a delicious and spicy dish to serve this summer for picnics and BBQ’s? Look no further, we are sharing our creamy sriracha macaroni salad recipe on the blog today. With the glory days of spring and summer just around the corner, you are going to want to double this recipe and seriously consider sharing it with friends and family. It is so darn good. 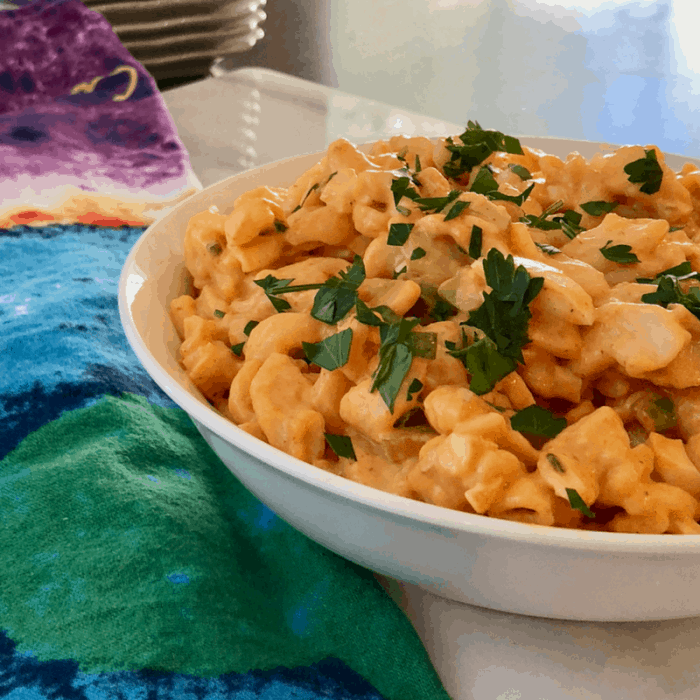 The spicy sweetness of the sriracha sauce with the creamy macaroni salad is a perfect combination. Note: I made this recipe using our Instant Pot. However, feel free to cook the cook three hard-boiled eggs and the pasta using pans you have at home. 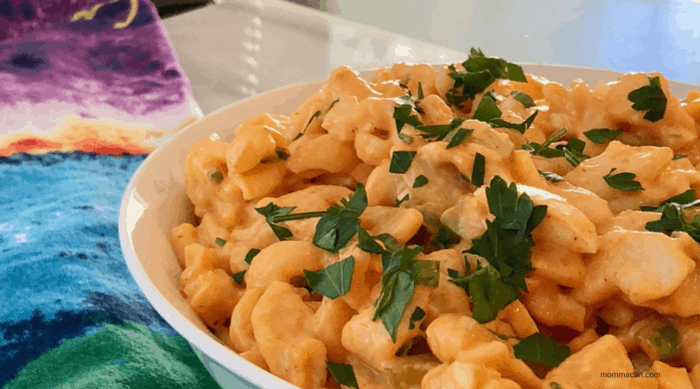 The Instant Pot does make clean-up easier but it is not a deal breaker for this creamy sriracha macaroni salad. The ultimate pairing for our Sriracha Sticky Chicken Legs and our Oven Roasted Corn on the Cob. 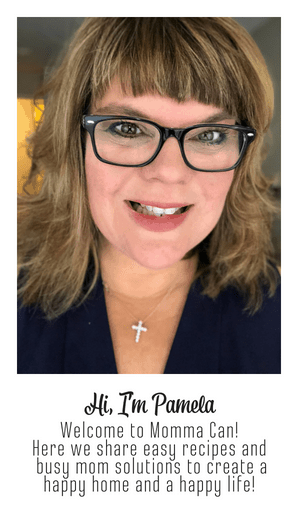 Instant Pot – Or saucepans and pasta pot! 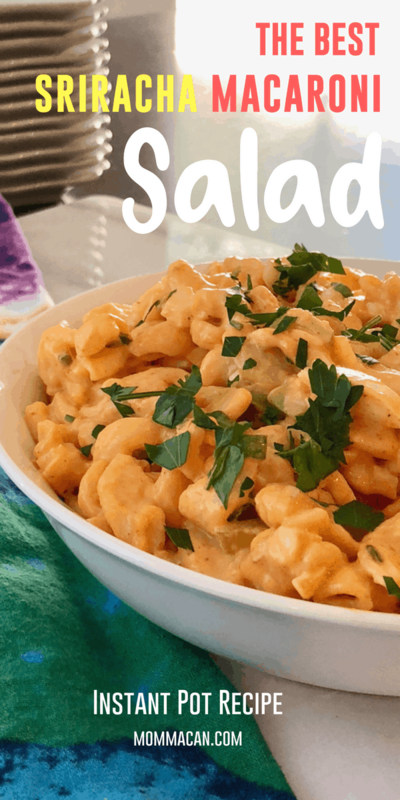 Spice up your summer BBQ’s, parties and picnics with this fabulous and super spicy sriracha macaroni salad! Add the macaroni elbows, eggs, water, and salt to the pressure cooking pot. Lock lid in place, select High Pressure, 5 minutes cook time and press start. When timer beeps, turn off pressure cooker and let pressure release naturally for 5 minutes, then release any remaining pressure moving pressure lever. Be careful of steam! When the pressure is released, carefully remove the lid. Remove the eggs with a pair of tongs and place them in ice cold water. Drain macaroni in a colander and rinse with cold water. When eggs are cool peel and dice. In a large bowl, mix together, mayonnaise, mustard, Sriracha chili sauce, and sugar. Stir in macaroni, celery, green scallions, and diced eggs. Add salt and pepper to taste. Garnish with chopped parsley or chopped green scallions.